Fred Couples finished at 1-under 71 and was tied for 39th in the 78-man field of the Boeing Classic at the Club at Snoqualmie Ridge. 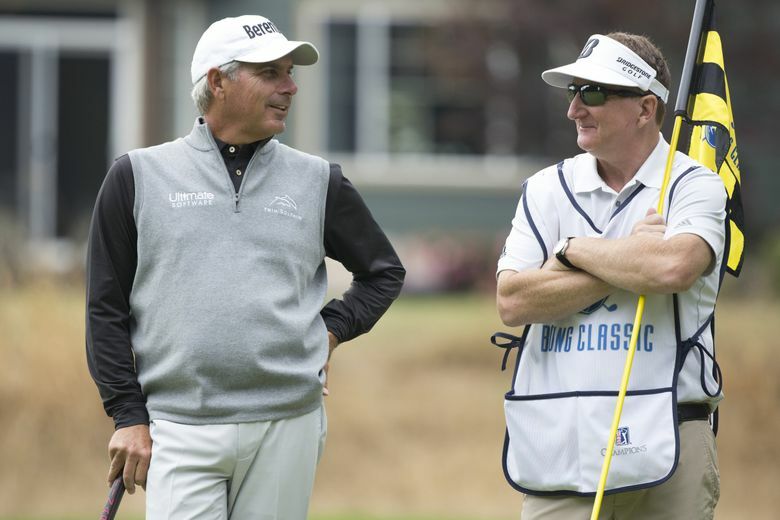 New year, same story at the Boeing Classic after Day 1 for Fred Couples. “It’s what I talk about every time – if you look at these guys (deep) under par, they are going to be two or three under par on the par-5’s and I’m even par (on them) and I never get any momentum,” Couples said. 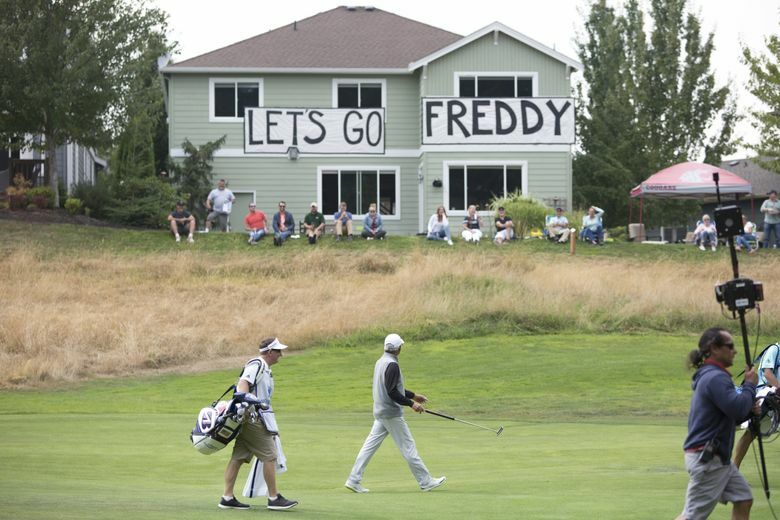 Couples, who had five birdies and a double-bogey on the back nine, finished at 1-under 71 and was tied for 39th in the 78-man field at the Club at Snoqualmie Ridge. He said any golfer not in contention after the first round of a Champions Tour event is “really in trouble” because they are 54-hole events instead of 72-hole tournaments. “I play a lot of the holes solid. I just butcher some the holes that make the round go from 68 or 69 to a 70 or 71 and I do it every year,” said the most famous male golfer in state history. Couples bogeyed the par-5 first hole when his ball plugged in a fairway bunker, parred the next two par-5s then birdied the par-5 18th hole after taking a double-bogey on the par-3 17th when his tee shot was partially submerged. He took a drop rather than attempt a risky shot and missed a makable bogey putt. “I don’t really usually go and take my shoes off and splash it out of there,” Couples said of his decision not to attempt what he called a “50-50” shot. (bullet) Shot of the day: Two-time Boeing Classic winner Bernhard Langer sank his approach shot from 160 yards on the par-4 11th hole. (bullet) Brandt Jobe (shoulder) was a late withdrawal and was replaced by Dudley Hart. (bullet) Play starts Saturday at 10 a.m. off both tees No. 1 and No. 10. Grouping will be based on Friday performance. (bullet) Pierce County native Brian Mogg started slow and finished fast – with three bogeys to start the round and three birdies to finish it for an even-par 72. (bullet)The low flyover by a Boeing 787-9 to start the tournament was one of the most memorable in the tournament’s 14-year history. Pilot Mike Bryan did wing-waves over the course followed by some steep banking in two passes in the Hainan Airlines jetliner. (bullet) A hole-in-one was shot in the Korean Air Pro-Am Thursday by Landyn Dunlap of Kirkland. She aced the par-3 ninth hole from 119 yards with a 9-iron. Dunlap, who has been playing golf for four years, was in a foursome headed by Darren Clarke, winner of the 2011 British Open at Royal St. George’s in England. (bullet) Thursday’s winning team in the scramble competition was the fivesome headed by pro Todd Hamilton with Bill Church, Matt Fennel, Frank Necci and Gene Stephenson at 20 under. (bullet) Wednesday’s pro-am was won by the fivesome led by pro Tommy Armour III with David Coltom, Brandon Roberts, Eric Tudquist and Devin Vata at 21 under. They beat Olin Browne’s fivesome, which also finished at 21 under, on tiebreaker criteria. (bullet) Players from 12 nations are in the tournament and their countries’ flags are flying above the stands behind the driving range. (bullet) A kids’ fun zone will be at the tournament from 10 a.m. to 1 p.m. Saturday. Sunday will be Military Appreciation Day at the tournament. (bullet) The tournament has more than 750 volunteers and they will be feted with the annual volunteers’ barbecue Saturday night. (bullet) Boeing employees and retirees with Boeing identification get free admission for themselves and one guest to the tournament.